The Michael Brose Trio was a cool treat on a warm day at the Biscuits & Jam Farmers Market, August 2. Jazz lovers got a rare treat at the Biscuits & Jam Farmer’s Market in downtown New Albany, Thursday afternoon, August 2. The Michael Brose Trio played jazz standards while people shopped for tomatoes and cucumbers. More people than usual actually sat and listened to the music. All three musicians are from north Mississippi. Chaz Monaghan, bass guitar with the Michael Brose Trio. Michael Brose, one of the four hundred or so residents of Glen, Mississippi in Alcorn County, is the band leader and principal guitarist. 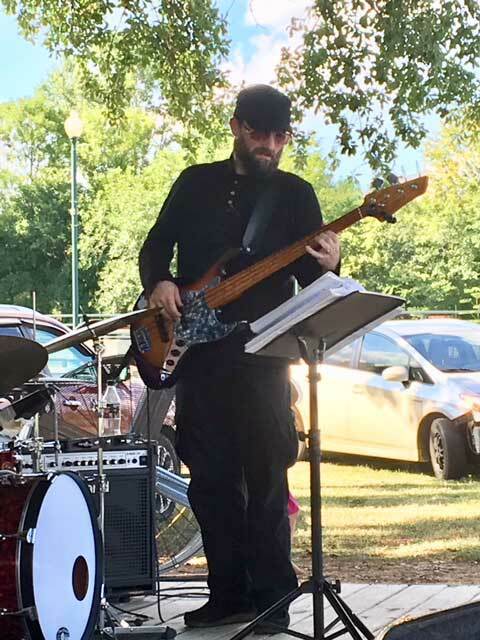 Drummer Eddie Rucker lives in Ripley, and his “day job” is teaching math at Blue Mountain College The bass guitarist is Chaz Monaghan, a Monroe County native, who now lives in Ecru. A crowd favorite was “Moonlight in Vermont.” Margaret Whiting first recorded it in 1943 with the Billy Butterfield Orchestra. It sold a million copies. It has been recorded dozens of times by artists including Billie Holiday, Frank Sinatra, Stan Getz, Jo Stafford and Willie Nelson, who has said that it’s his favorite song. Ella Fitzgerald and Louis Armstrong recorded it together during the 1950s. The Michael Brose Trio’s instrumental version of “Moonlight in Vermont” would be enjoyed by jazz lovers anywhere, and people in New Albany heard it “for free” Thursday afternoon. The Biscuits & Jam Market is in downtown New Albany from 4 to 7 p.m. Thursdays through the end of August.